Chris Gable has been performing at weddings, corporate gigs and private parties for well over a decade, as a soloist and part of small to large bands; as such, he has sufficient experience to know that there’s no one-size-fits-all solution to clients’ entertainment needs. However, the three musicians featured in the Chris Gable Trio have most bases covered between them. 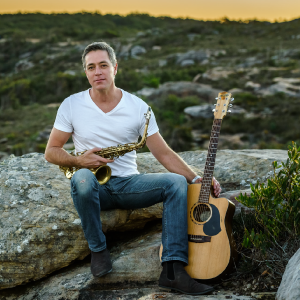 Chris performs regularly as a solo guitar/vocalist, with the wonderful point of difference that he is a truly amazing saxophonist. As a soloist he switches between guitar & vocals and playing sax / singing over pre-recorded backings. He has an impressively wide-ranging repertoire from jazz & swing to Top 40 and classic hits. Of course, backings aren’t anything like as good as actual musicians… but they get the job done when space or budget is limited. The Chris Gable Duo adds Tim Wilson on bass, guitar and backing vocals. A fellow multi-instrumentalist and vocalist, Tim and Chris essentially have two unique lineups available: Chris on sax & Tim on guitar, where we specialise in classy renditions of popular tunes (with the option of sticking to jazz standards if that’s your thing); or Chris on guitar/vocals and Tim on bass/vocals, opening up all the usual guitar/vocal repertoire with the added benefit of Tim on bass & harmonies. The Chris Gable Trio adds Luke Thatcher on drums & percussion – and, like the duo, is essentially two bands in one. Luke plays cajon (hand percussion) for the quieter sets where Tim and I stick to guitar and sax; for a bigger, more typical covers band sound, we go to vocals, guitar, bass and drums; this is the lineup for performing dance sets to crowds large or small.